ScapeLyfe provides our readers with in-depth news and information about Aquascaping, and we cover everything from daily maintenance and water changes, to long-format coverage of substrates, filters, and more. Read more about what we do. Fresh­wa­ter plants can be a strug­gle — even for vet­er­ans! Let’s check out the best plant choic­es so you’re not left hold­ing brown leaves in a week! With its famous tough­ness, along with its abil­i­ty to tol­er­ate almost any water con­di­tions a begin­ner could throw at it, we think Anu­bias Nana is a great choice for begin­ner aquascapers. We think Anu­bias Nana is a great plant choice for most begin­ner aquas­cap­ers. It’s tough enough to sur­vive the mis­takes that every­body makes in their first few tanks, and it’s still appeal­ing for most aquas­cap­ing styles. In addi­tion, it’s also eas­i­ly-main­tained, and requires very lit­tle trimming. We cre­at­ed the above specs for each plant we grew, and test­ed the rec­om­mend­ed amount of light for each plant. We allowed each plant to grow for 30 days, and record­ed the results. The water changes were to help con­trol the usu­al detri­tus and algae blooms that can hap­pen with new­ly-plant­ed tanks and high-light sit­u­a­tions. Luck­i­ly, we were able to suc­cess­ful­ly con­trol algae out­breaks, and didn’t have a prob­lem dur­ing our testing. 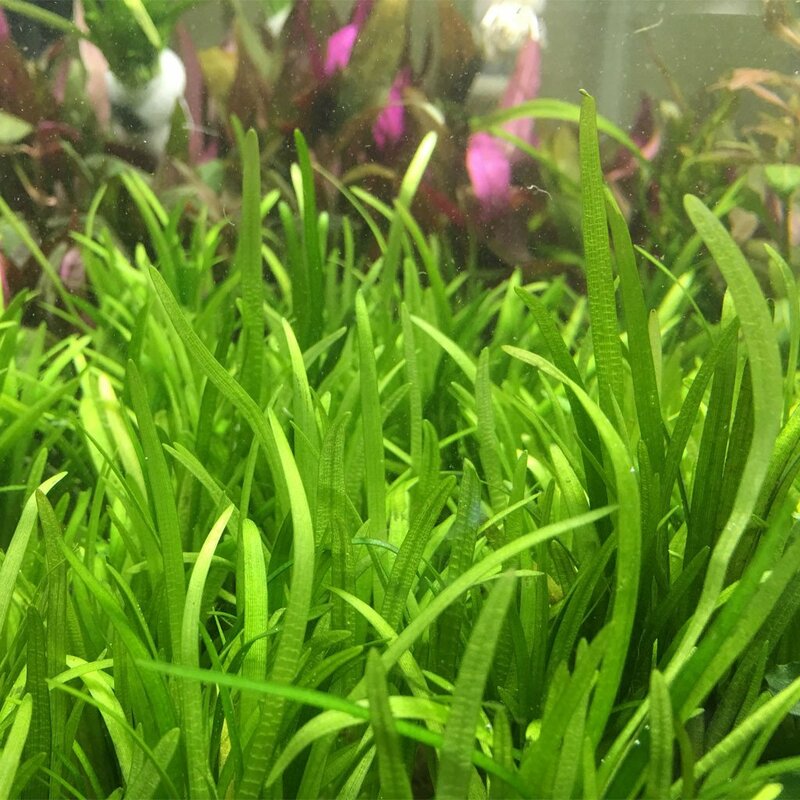 Java Moss is per­fect for the begin­ner — it tol­er­ates any light qual­i­ty, and any water qual­i­ty. Sim­ply put: it’s real­ly hard to kill. 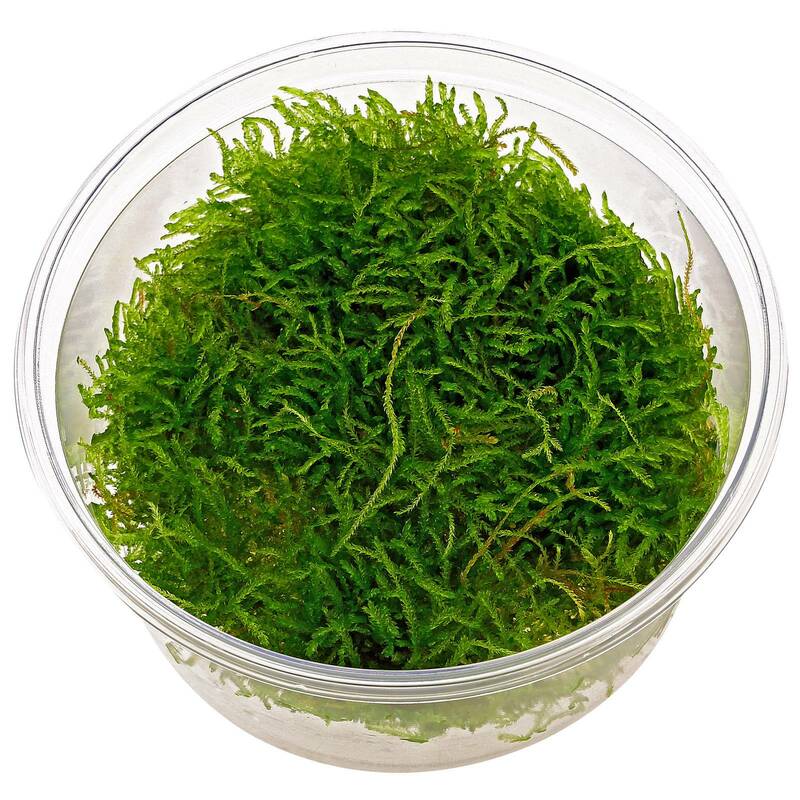 Java moss is like­ly the best choice for a fresh­wa­ter plant, as far as begin­ners are con­cerned. it’s a ​‘feath­er’ type moss that like­ly orig­i­nat­ed in South­east Asia, and is per­fect for three pri­ma­ry rea­sons: It can clean your water, help pre­vent algae blooms, and pro­vide shel­ter for fry, if you’re attempt­ing to breed fish. It’s extreme­ly thriv­ing in near­ly any sit­u­a­tion: it’ll even grow in slight­ly brack­ish water! 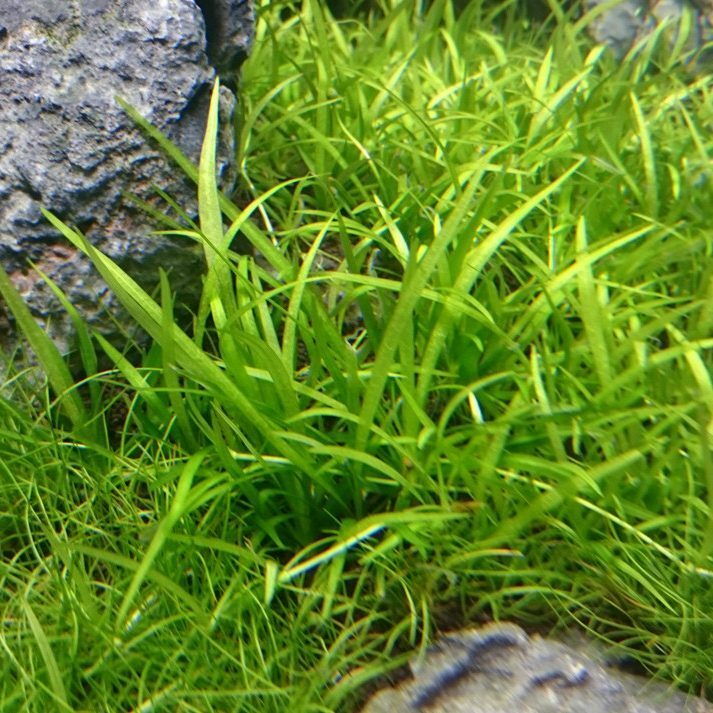 Java moss grows well in any light con­di­tions, and thrives at around 70 – 75º F. It does get dirty eas­i­ly (because of its feath­ery appear­ance), so it’s impor­tant to make sure you have enough water move­ment to keep it free of refuse, or else it’ll get a brown, fur­ry appearance. Best of all, it’s eas­i­ly mul­ti­plied! Just split it and replant, and it’ll keep right on growing! A great option for begin­ners that want a car­pet­ing tank with­out the headaches of some oth­er species. Able to sur­vive in most water con­di­tions, Mar­silea Min­u­ta is a great choice for begin­ners because of its tol­er­ance of light con­di­tions, although it’ll get leg­gy in low-light tanks. 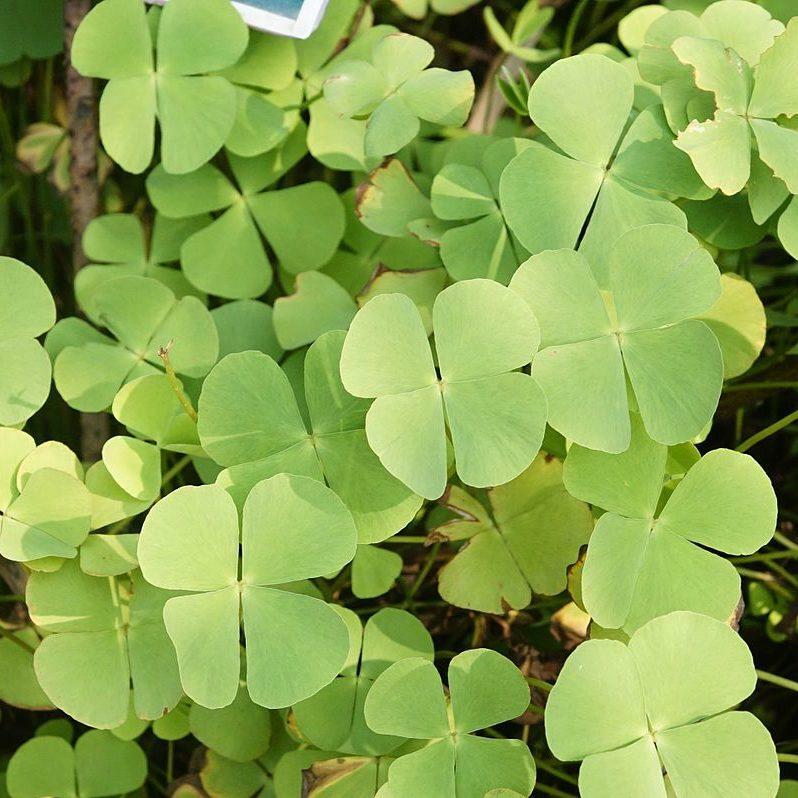 Mar­silea Min­u­ta (also known as ​‘Dwarf Water­clover’) is a hardy plant that looks visu­al­ly sim­i­lar to a four-leaf clover, and is anoth­er great choice for begin­ner aquas­cap­ers that’s able to sur­vive basi­cal­ly any mistakes. MM grows via ​‘rhi­zome’, which means that it sends out roots under the soil, occa­sion­al­ly sprout­ing the leafy stems we see. It does have a ten­den­cy to ​‘car­pet’ under high light sit­u­a­tions. (If your tank is low­er light, it does have a ten­den­cy to grow ver­ti­cal­ly instead.) Mar­silea Min­u­ta can grow in essen­tial­ly any water con­di­tions (includ­ing brack­ish), and thrives around 68 – 84º F.
If you’re going to try and make a car­pet from Mar­silea Min­u­ta, you’ll want a loose­ly-packed, fine soil (like sand) to allow the rhi­zome enough sur­face area to spread effectively. A great choice for begin­ners start­ing a medi­um-sized tank. Ama­zon Sword is a rel­a­tive­ly-hardy plant that’s per­fect for hid­ing your tank’s gear. It’ll need fre­quent trim­ming for small­er tanks to pre­vent a takeover. Ama­zon Sword is anoth­er hardy choice for begin­ner aquas­cap­ers. There are actu­al­ly a few dif­fer­ent vari­eties of AS, some with broad leaves, and oth­ers with thin­ner leaves, so be sure you’re get­ting the type you’d pre­fer when purchasing. Ama­zon Swords can also grow quite large — as much as 10 – 20 inch­es! As a result, it’s usu­al­ly used as a cen­ter­piece, or to hide aquar­i­um equip­ment like a heater, or fil­ter uptake tube. You’ll also often see Swords in ​‘for­est’ type aquascapes. If you’re aquas­cap­ing a small­er tank, Ama­zon Sword will require fre­quent trim­ming to pre­vent a takeover, in addi­tion to the addi­tion­al algae main­te­nance it’ll like­ly cause for beginners. Ama­zon Swords love high light. Long hours of high-light cause it to thrive, even as much as 10 – 12 hours a day. As a result, it usu­al­ly caus­es algae bloom­ing issues, and requires some­what good water con­di­tions to pre­vent an algae takeover. Those algae prob­lems can be eas­i­ly-solved by includ­ing shrimp with the aquas­cape — they’ll keep the Ama­zon Sword (and tank in gen­er­al) more clean, help­ing to pre­vent outbreaks. You can prop­a­gate Ama­zon Sword by trim­ming the ​‘bulbs’ from the par­ent plant and care­ful­ly replant­i­ng them, ensur­ing the crown is above the sub­strate surface. Pygmy Chain Sword forms a beau­ti­ful car­pet in high-light tanks, and isn’t too chal­leng­ing for begin­ners to grow and maintain. Pygmy Chain Sword is the small­est of the ​‘Sword’ plants, reach­ing a max­i­mum height of ~4 inch­es. 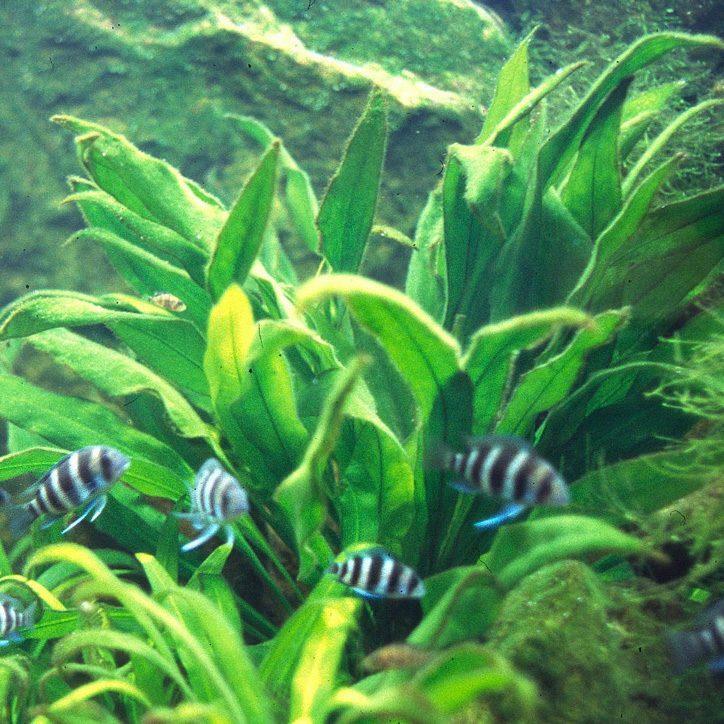 It’s com­mon­ly used to form car­pets, with its thin, long leaves pro­vid­ing a lush ​‘floor’ to the aquascape. PCS nat­u­ral­ly occurrs along shores, so it’s not sur­pris­ing that it requires a fine soil for its rhi­zome, and lots of light to sup­port its fast growth. While Pygmy Chain will sur­vive low­er-light tanks, it’s best to give it as much light as pos­si­ble to encour­age carpeting. It’s best suit­ed for 68 – 84º F, and requires at _​least_​a mod­er­ate amount of light to form a car­pet. High light is opti­mal, and pro­vid­ing 12 – 14 hours of light per day is best for those thick car­pets it’s known to form. An extreme­ly-fast grow­ing plant that’s per­fect for back­grounds and mid-grounds with trimming. Dwarf Sagit­taria is a sol­id choice for aquas­cap­ers that want to see fast-growth in their plant­ed tanks. Dwarf Sagit­taria is a fan­tas­tic choice for aquas­cap­ers that want fast results from their plant growth. It grows quite quick­ly, and can even grow com­plete­ly out of of small­er tanks! 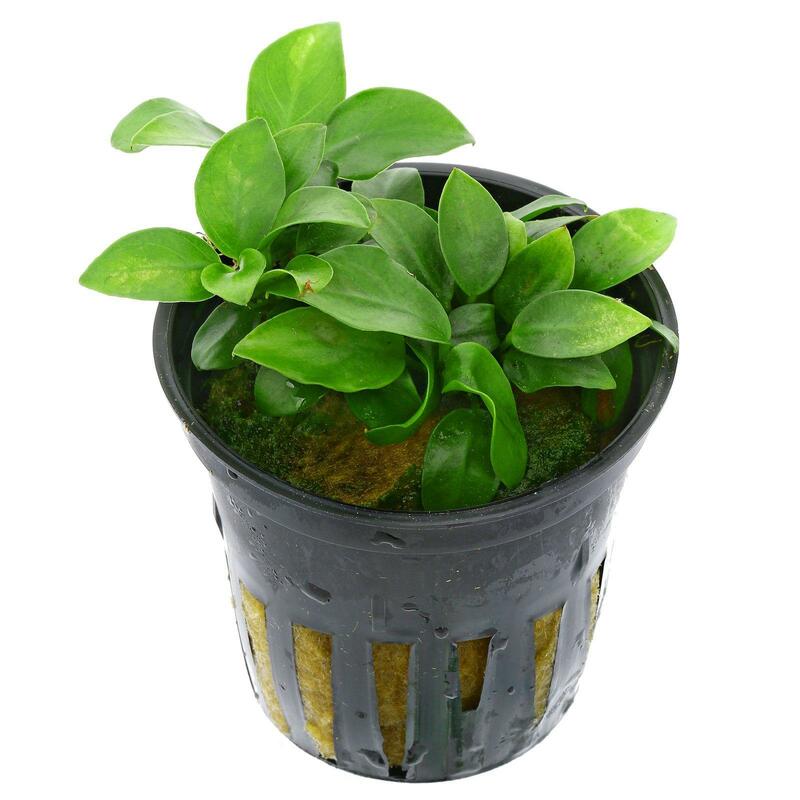 It prop­a­gates quick­ly, and isn’t sen­si­tive to tem­per­a­ture changes in the aquas­cape — but it grows best around 72 – 82º F. While CO2 isn’t required for it to sur­vive, Dwarf Sagit­taria grows extreme­ly quick­ly when it’s used. Dwarf Sagit­taria tol­er­ates all sub­strates types — even grav­el sub­strates, as long as high light is pro­vid­ed. (For opti­mal growth, high light, fine + fer­ti­zlied sub­strates, and con­sis­tent trim­ming is best.) We found fan­tas­tic growth with dosed ferts, high water move­ment, and CO2 diffusion. While this plant is green in most tanks, in high-light aquas­capes it can take on a red hue, pro­vid­ing a visu­al flare to tanks. With its clas­sic flared-lip-pan shape, slick non­stick coat­ing, and com­fort­able han­dle, the Tra­mon­ti­na is a qual­i­ty pan that will last for years, espe­cial­ly with use. Anu­bias Nana (AKA Dwarf Anu­bias) is the small­est plant in its fam­i­ly, only grow­ing to around 4 – 5 inch­es. How­ev­er, what it lacks in height is made up for in tough­ness — it’s so tough, its leaves feel like leather! It’s extreme­ly hardy, but is best-suit­ed for 72 – 82º F.
Anu­bias grows via rhi­zome, but usu­al­ly isn’t used as a car­pet, due to its extreme­ly slow growth — It’s com­mon to see one leaf a month! If you do choose to plant it, take care to ensure the rhi­zome is above the sub­strate, oth­er­wise it’ll pre­vent much growth. The wait’s worth it, though, as Anu­bias Nana also occa­sion­al­ly pro­duces beau­ti­ful, white flow­ers! These flow­ers also stick around for quite a while. You’ll want to plant this in low-medi­um light con­di­tions; high-light sit­u­a­tions cause it to com­pact, and are more sus­cep­ti­ble to algae blooms. You can anchor it eas­i­ly by attach­ing it to a rock or drift­wood via fish­ing line. What’s been your expe­ri­ence with aquas­cap­ing? Is there a spe­cif­ic plant that you’ve had suc­cess with? (Or maybe a fail­ure?) Let us know in the comments! 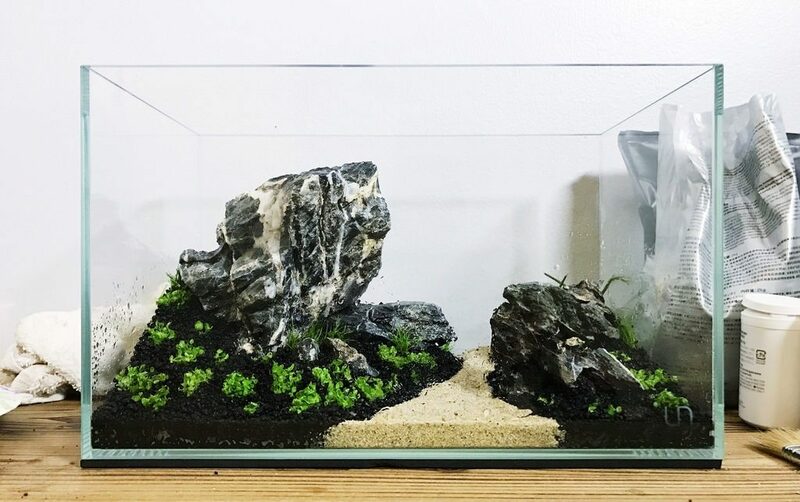 Build a better Aquascape.Sign up to get the latest aquascape techniques each week. Scape­Lyfe is a resource for aquas­cap­ing cre­at­ed by Tay­lor Daugh­try in 2019. We’re inde­pen­dent, and we don’t accept man­u­fac­tur­er influ­ence for any prod­uct, tech­nique, or resource we review.